Somewhere in the middle of the second set of every Grateful Dead show the band turns a corner. They enter a musical environment without walls or structure. The song form is abandoned, and the very elements of music may be called into question. The only mandate is to explore new territory. It is an environment where rhythm, tone, color, melody, and harmony can be explored without rules or predetermination, a musical adventure where composition and performance are one. This album is about that adventure. I have attempted to sift through these explorations, distilling moments where the Grateful Dead magic occurs in its highest form. All the material was performed live by the Grateful Dead in concert. But instead of presenting this material as it was performed in a show, I have focused on specific musical themes. Some pieces have been created from performances of the same night. Others have been created from multiple shows. I have tried to focus the energy of the selections while maintaining the integrity and nuance of each performer. Join the magical voyage through the Grateful Dead's vastly different soundscapes. Tear up your set lists, sit back and listen! This CD is an ADD recording. Multi-track analog tape was mixed to a digital format and then digitally mastered for the CD. The original multi-track recordings were all done on a twenty-four track analog machine using Dolby SR noice reduction. Two-track masters were used in Crowd Sculpture, Parallelogram, Speaking in Swords, Sparrow Hawk Row, and River of Nine Sorrows. These masters were transferred to the twenty-four-track machine, where they were combined with multi-track recordings, manipulated, and processed for the final result. Silver Apples of the Moon was recorded as MIDI data into a computer during several performances and was edited and orchestrated from the computer before being recorded as sound information on the multi-track tape. 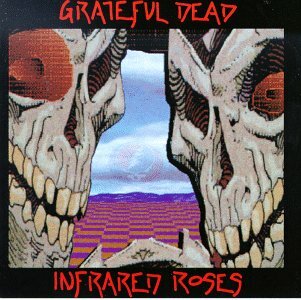 Infrared Roses was released in November 1991. It is an entirely experimental album put together by Bob Bralove to highlight exceptional space/drums sections from five years of concerts. "Silver Apples of the Moon" is a variation of "Dark Star" themes by Bruce Hornsby and Vince Welnick at the Wembley Arena in London on November 1, 1990. "Apollo at the Ritz" features Branford Marsalis and the Grateful Dead at the Nassau Coliseum on March 29, 1990.